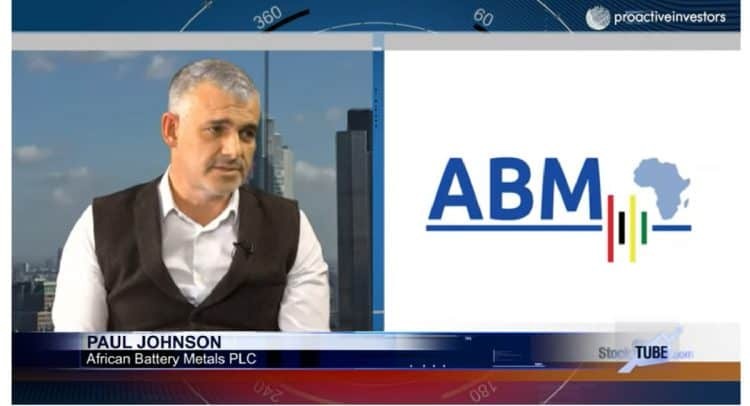 African Battery Metals PLC’s (LON:ABM) Paul Johnson speaks to Proactive London’s Andrew Scott after announcing they’ve restarted exploration activities at the Kisinka Copper-Cobalt project in the Democratic Republic of Congo following a detailed review of historic exploration. Johnson says the exploration programme will adopt a staged approach with initial wide-area exploration focused on identifying areas of anomalous copper and cobalt mineralisation. ABM is an AIM listed, Africa focused, resource company exploring for the key metals used in next generation batteries that fuel the new electric vehicle revolution. The Board and team of advisors, who have proven expertise in African exploration, mining and project generation, have identified an opportunity to utilise the Company’s position to become a leader in the London market for investors to gain exposure to the battery metal commodity suite, particularly cobalt, lithium, copper and nickel.